The 2010 Karapoti was my 4th Karapoti. When I think back to the first time I went around Karapoti, the big hills, the mud, getting lost with my Dad, I never thought I would enter agin far less 3 more times. Karapoti has that pull factor and it is one event I really don't want to miss. Just like a marathon, sub 4 hours has always been the goal for me. This should have happened in 2009 but wet, muddy conditions prevented this. Going into 2010 I was really unsure how I would go. I felt fully recovered from the Brevet but who knows I was still having those "I can't be bothered moments." I was pretty confident I could do a pb. Two days before the race I made a random new bike purchase, a hard tail when I am used a full suspension and decided to use brand new untested tyres. I am always a slow starter and it felt like every female in the field had passed me by the top of Deadwood. For some reason the hills didn't seem so long but I felt very slow. On the rolling hills across to the Rock Garden I managed to pass a lot of people. In fact I am pretty sure know one passed from from behind after the top of Deadwood. I felt really good in this section and strong too. Big wheels are great for carrying momentum and when you have to ride around people off the riding line. This year there seemed to be a lot of people in my way. This is the problem in starting with the last group. This year I seemed to be catching more people than in the past and the slower riders from the groups ahead seem to have little awareness that there are faster people coming from behind. I suppose this is one of things that makes Karapoti what it is, all sorts of people big and small, fast and slow come out and have a go. 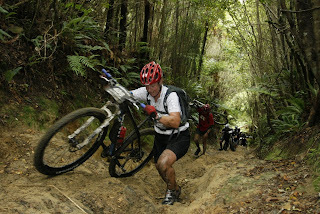 My riding in the rock garden was limited to the first drop and by then my inexperience on a hardtail and people everywhere reduced me to a run. At the bottom of the Rock Garden I had an involuntary mud bath much to the joy of my fellow riders. The push up the Devils Stair Case was as always tough but I always find it a turning point in the race as this is when I try and pick up the pace. At this point I started to smash it and got past another 3 girls. 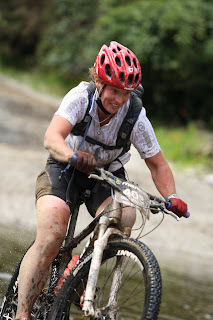 The new bike decended like a dream and when I roared through the stream at the bottom of Titi I knew I was on for a pb. I caught poor Rachel at the bottom of Dopers who had had a puncture nightmare and really pushed myself up Dopers to keep up with her. I cramped about 3/4 up and the cramp stop seemed to work. About 1/4 of the way down I spotted Rachel again and then "bang" and high speed crash! Lucky there was no damage done. Within no time I was at the bottom of Dopers and heading down the gorge. 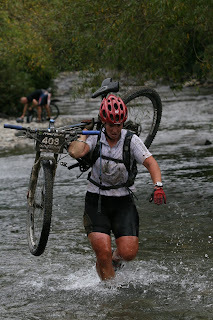 I must have passed 30 people in the gorge, cramped gain and then saw Rachel again walking with more puncture problems. I couldn't help as I only has 29" tubes but as soon as I finished I spotted Liam and he went to Rachels rescue.